Is Subprime Auto Lending the Next Housing Bubble? America’s pro-car transportation policies are exerting crushing costs on low-income people — and may be slowing down the overall economy, a new report shows. Auto loan rates are soaring, particularly among the most vulnerable borrowers. And lower-income people are being subjected to a range of shady practices in auto lending, like subprime loans and racial discrimination, the U.S. Public Interest Research Group and Frontier Group say in their report. It’s starting look almost like a bubble. 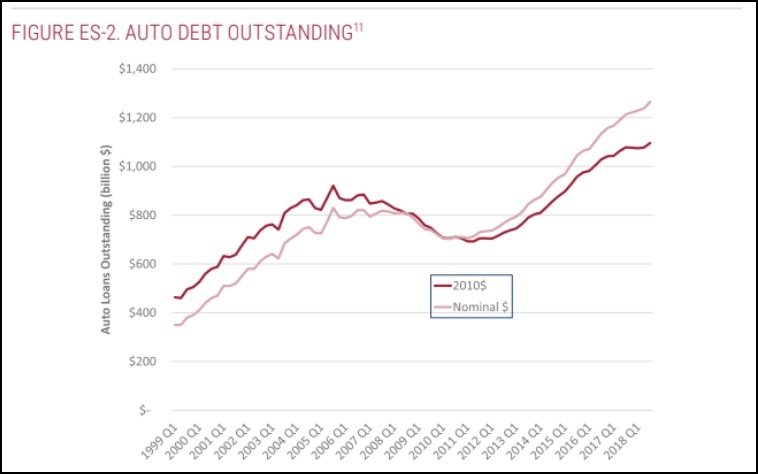 Car debt has grown an astonishing 75 percent since 2009 to about $1.26 trillion, or roughly 5.5 percent of GDP, PIRG reports. Perhaps more concerning: A record 7 million Americans are now three months behind on their car payments, a sign that the American economy could be faltering, the Washington Post reported on Tuesday. Transportation is the second-leading expense for American households, behind housing. And for workers, owning a car is practically a necessity in most of America. About 86 percent of American workers drive alone to work. Even in some of the most transit accessible places, a surprising share of workers rely on driving. In the New York City metro region, with its extensive city-wide subway and regional rail lines, only 15 percent of the area’s jobs are accessible in an hour on transit, but 75 percent of the region’s jobs could be accessed in the same amount of time by a car driver, PIRG claims. Americans are coping by borrowing — that’s in part thanks to looser lending standards. In 2018, there were 113 million auto loans open, up 39 percent since 2010. And Americans are extending the length of their loans. About 42 percent of auto loans now last 6 years or longer — which cost more over the long haul. New cars now are almost always financed — about 85 percent, compared to 75 percent a decade ago. And even with used cars, a majority — 53 percent — were financed in 2018. Discrimination is common. Lenders as diverse as Toyota, Fifth Third bank and the lending company Ally have all been fined by the Consumer Finance Protection Bureau for overcharging black and Hispanic borrowers. Past research has established that black borrowers pay on average $300 to $500 more for an auto loan. Other lending abuses are profligate. Some borrowers will pursue back payments on loans even after repossessing the car, PIRG reports. Lenders like Santander repossessed a single vehicle from customers as many as three or four times. Reforms are also needed in transportation policy so that more people can work and live a full life without owning a car. 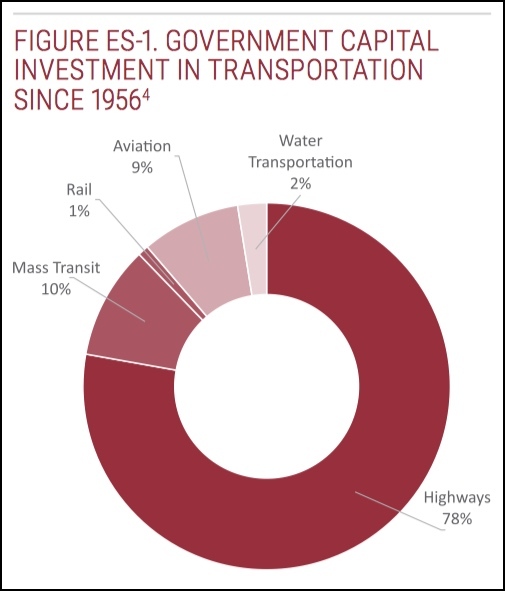 Transportation investment over the last two generations has flowed overwhelmingly to highways (see graph, right). In addition, the U.S. needs land-use policies that encourage more walkable, transit-accessible housing development. In addition, greater investment in transit and more street space dedicated to transit, walking and biking could help create a dynamic where people don’t have to mortgage their futures to get to work. Cities with more compact land use tend to have lower household spending on transportation. For example, Texas was the top state for auto lending, according to PIRG’s report. The average borrower there owes $7,000. 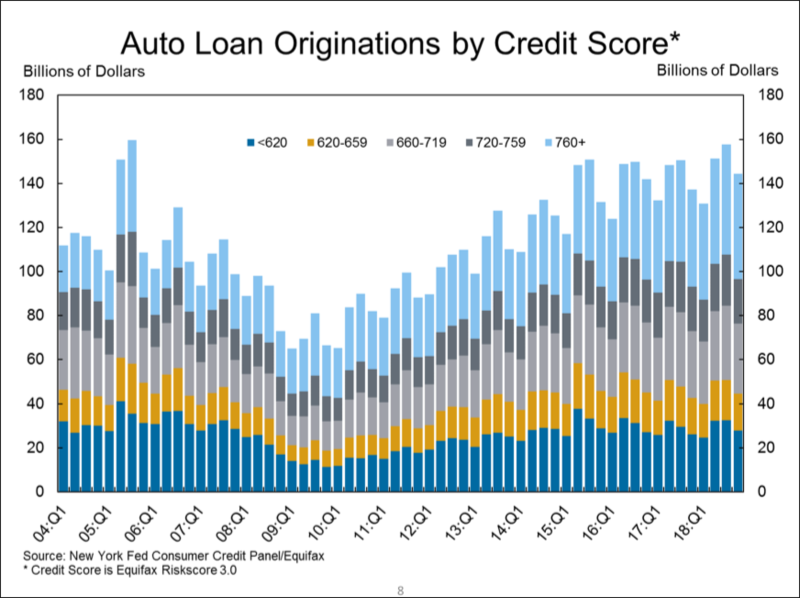 But rather than free us from auto dependence, cheap auto loans are worsening the problem. PIRG estimates that increased auto lending may have boosted greenhouse gas emissions from transportation as much as 6 percent between 2010 and 2016. A study released today by TransitCenter also named them as a leading cause in the national drop-off in transit ridership. 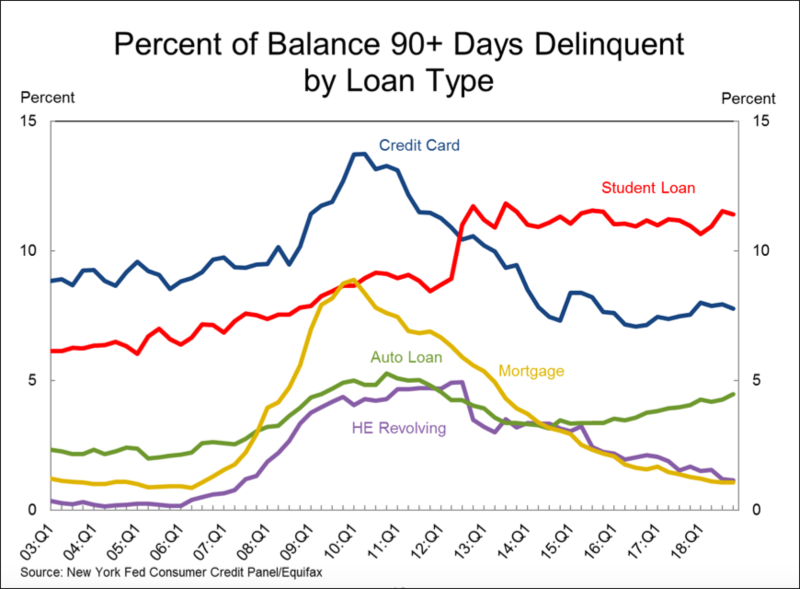 Also alarming: The number of delinquent auto loans is on the rise — and the proportion of auto loans held by people with poor credit is also on the rise, as the Federal Reserve reported earlier this week (see charts below). Best not to borrow money to buy a car if at all possible. If you need a car, try to save up for it. You’ll pay out so much less in the long run and you’ll have a financial cushion you can tap in an emergency. If I had to put my money on which bubble will burst first, it would be the student loan bubble by a mile. Bubble or not, I think this one could come back on the lenders. You can’t park a house in a friend’s garage. You can’t hide a student loan in a storage unit. Some lenders will get burned here and maybe it just couldn’t happen to a nicer bunch of people. A lot of discussion about the cost of transportation is centered on the infrastructure. This makes billion dollar highways look good next to billion dollar subway lines. But this way of comparing doesn’t take into consideration the extremely unsustainable cost of maintaining all those individual vehicles. For now, it’s the poor who are stressed to the max by this cost, but in changing economic circumstances, the entire economy and society will collapse because no one will be able to go anywhere – unless they have ten grand every year to shell out to corporations. Yikes. Ten grand per year. That’s a pretty serious “drug” habit to work around. One thing that confuses me is that Americans spend so much on cars. Surely there must be a vehicle design that would get you to work and only cost a few thousand new. I mean something like the three wheeled vehicles you saw in Europe shortly after WWII. If a car loan bubble ever emerges, it will only happen if the lenders are bullied into lending the way they were with houses in the 1990s and 2000s (the stick) and if an agency like Fannie Mae or Freddie Mac is there to underwrite it all (the carrots). Playing “Affirmative Action” with lending markets would be a sure path to disaster, again. No that’s not the only way it could happen. Then Clinton got in and the lenders came back and got him to sign off on the deal. The lenders wrote lots of no-doc loans, cut them up and sold them to investors, repossessed any houses that went into default and resold the properties at a profit. No problem, no risk and the lenders made a fortune. Until the market was saturated and too many loans defaulted at once, the lenders could no longer sell off the loans and the ponzi scheme collapsed of its own weight. You’ll know if the same thing is happening again if the lenders are making bad loans with the intent of reselling the cars after any defaults, if they’re reselling the same car 2 or 3 times, and if the default rate starts to climb to unusual numbers. Kind of like what’s happening now. Oh, no. Never mind. He thought it would be a great idea to build a new experimental engine, so he squandered all his resources and it looks like that isn’t going to happen now.